Germany does not set out in detail in federal law the grounds on which police officers may use their firearms in the performance of their duties. The Constitution of the Federal Republic of Germany is the Basic Law, as last amended on 23 December 2014. The Basic Law stipulates that human dignity is inviolable and obligates the state to respect and protect human rights.Art. 1(1), Basic Law for the Federal Republic of Germany, as last amended on 23 December 2014.Every person is accorded the rights to life and to physical integrity.Art. 2(2), Basic Law for the Federal Republic of Germany, as last amended on 23 December 2014. 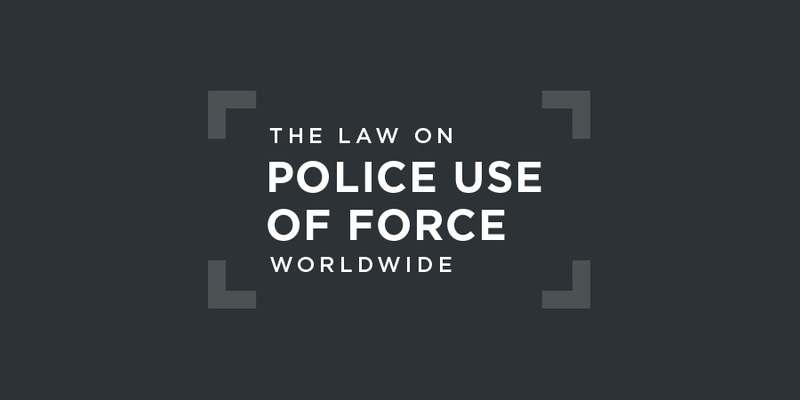 At federal level, police use of force is governed by the 1994 Federal Police Law. This allows the police to use necessary measures for the performance of their duties.S. 14(1), 1994 Federal Police Law.Where several options exist to achieve the desired law enforcement objective, the least harmful one for the suspect and the general public must be selected.S. 15(1), 1994 Federal Police Law. A person who, faced with an imminent danger to life, limb, freedom, honour, property or another legal interest which cannot otherwise be averted, commits an act to avert the danger from himself or another, does not act unlawfully, if, upon weighing the conflicting interests, in particular the affected legal interests and the degree of the danger facing them, the protected interest substantially outweighs the one interfered with. This shall apply only if and to the extent that the act committed is an adequate means to avert the danger. According to Amnesty International, both federal and state authorities have still to establish independent investigation mechanisms or oversight bodies. Three of Germany's regions (states: Länder) -- Bavaria, Bremen, and Hamburg -- have established units to conduct investigations into alleged excessive use of force by the police, but they form part of the respective Ministry of the Interior and are therefore not fully independent. It is further claimed that nine in ten police officers are not convicted of any offence following an investigation. (a) all allegations of ill-treatment by police and prison officers are assessed, promptly, thoroughly and impartially investigated, (b) those responsible are punished accordingly, and (c) victims are provided with compensation; The State party should also ensure that victims of ill-treatment by police and prison officers are aware of their rights and can lodge complaints without fear of reprisals. The State party should further set up independent complaint bodies to deal with police allegations of ill-treatment, as previously recommended by the Committee.Human Rights Committee, Concluding Observations on Germany, UN doc. CCPR/C/DEU/CO/6, 12 November 2012, §10. the fear of physical torture may itself constitute mental torture. However, there appears to be broad agreement, and the Court likewise considers, that the classification of whether a given threat of physical torture amounted to psychological torture or to inhuman or degrading treatment depends upon all the circumstances of a given case, including, notably, the severity of the pressure exerted and the intensity of the mental suffering caused.European Court of Human Rights, Gäfgen v. Germany, Judgment (Grand Chamber), 1 June 2010 (as rectified on 3 June 2010), §108. The plaintiff had abducted and killed an 11-year-old boy and the police had used threats of torture to seek to persuade him to confess as to his whereabouts. In 2006, a young Black man of Congolese descent, Dominique Koumadio, was shot and killed after he reportedly brandished a knife when police officers confronted him on a street in Dortmund. He was said to be suffering from mental illness at the time. Two police officers shot him at close range, once in the leg and then a second time through the heart. The failure of the officers to act with more restraint prompted demonstrations against police brutality in Germany. His case has been memorialised as part of a perceived pattern of police violence against people of colour. The state prosecutor considered the actions of the police as in legitimate self-defence and closed the file on the investigation.